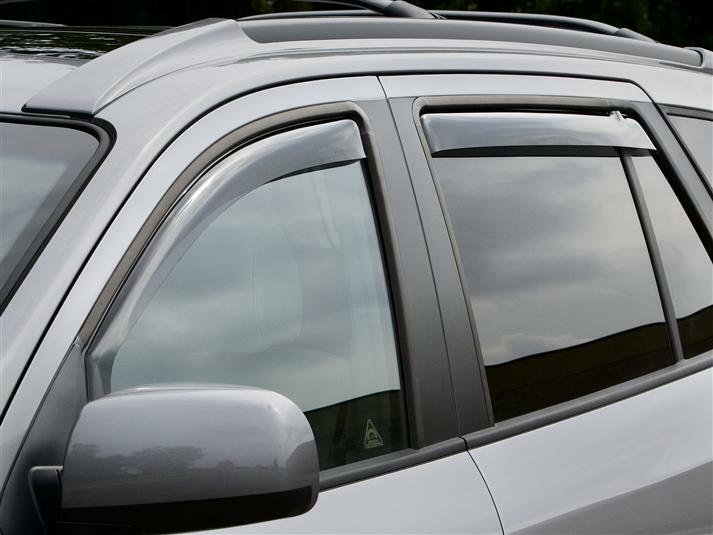 WeatherTech Side Window Deflectors are precision-machined to perfectly fit your 2007 Hyundai Santa Fe's window channel. These low profile window deflectors help to reduce wind noise and allow interior heat to escape. Our light tinted Side Window Deflectors are the only deflectors in the world made with a D.O.T. (U.S. Department of Transportation) approved glazing material. Available in light and dark tint for most vehicles. Designed and Engineered in USA – Handcrafted in Germany. This accessory given to a friend’s 2015 Santa Fe to enjoy fresh air during rain and on long trips is worth its price. This is a great gift to send to anyone that travels often. A friend once purchases a set as a Gift for a Cadillac. This was over 15 years ago and they still look just as new as the day put on the Caddy. The friend that gifted these Deflectors passed away. Every time it rains and windows stay, open the fresh rain air is grand without water coming in the car. They look graceful and smart with the right touch as a work of Art! On Hot Days one can crack your window keeping heat out of the car and no one knows they are slightly open. An exceptional accessorize to any vehicles for fresh air, security, and visual elegance that serves it purposes in many ways one will appreciate. Just purchased these wind deflectors for my 2015 Hyundai santa fe. Once I put them on I started to notice other vehicles and the wind deflectors that were installed on them. Man was I glad I got these from WeatherTech! There is nothing out there that compares to the look or quality of these. They look like original factory installed equipment and work exactly as they should. My wife agrees that they just add that special little something to her vehicle and it looks better with them than without. Great product WeatherTech,thanks.